GKIDS, the acclaimed producer and distributor of multiple Academy Award-nominated animated features, has revealed a new trailer for the U.S. release of MIRAI (未来のミライ, Mirai no Mirai) featuring the voices of John Cho (STAR TREK, HAROLD AND KUMAR, SEARCHING), Rebecca Hall (THE TOWN, IRON MAN 3, CHRISTINE) and Daniel Dae Kim (LOST, HAWAII FIVE-O). Miden steals the Precures’ memories in HUG! PRETTY CURE THE MOVIE ALL STARS MEMORIES. Image courtesy of Toei Co., Ltd.
Toei has provided information, a trailer and high-res images from HUG! PRETTY CURE THE MOVIE ALL STARS MEMORIES (映画ＨＵＧっと！プリキュア・ふたりはプリキュア　オールスターズメモリーズ, Eiga HuGtto! Purikyua Futari wa Purikyua Oru Sutaazu Memoriizu), the twenty-fifth feature film in the PRETTY CURE series. Music from the Studio Ghibli Films of Hayao Miyazaki celebrates the partnership between composer Joe Hisaishi and filmmaker Hayao Miyazaki (Academy Award Winner, Best Animated Feature Film 2002, SPIRITED AWAY). In this new Carnegie Hall concert production, Joe Hisaishi’s scores — including those from PRINCESS MONONOKE, MY NEIGHBOR TOTORO, and SPIRITED AWAY — are performed with full orchestra and choir and conducted by Hisaishi himself. The music accompanies montages from Miyazaki’s films, bringing the timeless work of Hisaishi and Miyazaki to vivid new life. Sora and Kanata are on the run in MONSTER STRIKE THE MOVIE: JOURNEY BEYOND THE SKY. Image courtesy of Warner Bros. Pictures Japan. © 2mixi, lnc. All rights reserved. Distributor Warner Bros. Pictures Japan has provided a trailer and images from their new anime film, MONSTER STRIKE THE MOVIE: JOURNEY BEYOND THE SKY (モンスターストライク THE MOVIE　ソラノカナタ, Monsutaa Sutoraiku THE MOVIE Sora no Kanata), opening in theaters across Japan on October 5. “ATTACK ON TITAN” Production Committee. Funimation Films will present ATTACK ON TITAN SEASON 2 MOVIE: ROAR OF AWAKENING (劇場版「進撃の巨人」Season 2～覚醒の咆哮～, Shingeki no Kyojin: Kakusei no Hookoo, 2018) and the ATTACK ON TITAN Season 3 world premiere as a two-night only event, July 10 – 11, 2018, in select U.S. and Canadian theaters. The ATTACK ON TITAN Season 3 world premiere immediately follows the recap movie with a special presentation of Episode 1 of the new season. This North American world premiere will be the first ever for the franchise and is a must-see event for U.S. and Canadian fans to experience ATTACK ON TITAN Season 3 nearly two weeks before the series’ scheduled television debut in Japan on July 22. ATTACK ON TITAN SEASON 2 MOVIE: ROAR OF AWAKENING and ATTACK ON TITAN Season 3 Episode 1 have a combined run-time of 141 minutes and will be presented in both Japanese with English subtitles and English dub on alternate nights in 130 theaters across the U.S. and Canada. Pony Canyon and Tsuburaya Productions have provided SciFi Japan with a press update on their upcoming superhero anime series, SSSS.GRIDMAN (SSSS.グリッドマン, SSSS.Guriddoman). Tsuburaya has produced the show with the animation studio TRIGGER, with Pony Canyon handling foreign sales. Key art, courtesy of Tsuburaya Productions. Tsuburaya Productions has provided SciFi Japan with press notes and high-res images from ULTRAMAN R/B (RUEBE) [ウルトラマンＲ／Ｂ(ルーブ), Urutoraman R/B (Ruubu)], their upcoming series featuring a pair of Ultraman brothers. 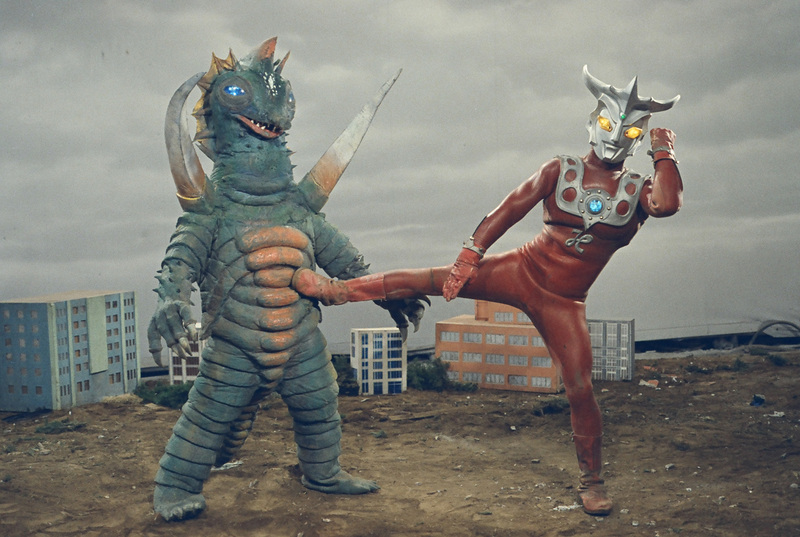 The Ultraman Series has been bringing heroes to the world for more than 50 years, since the first ULTRAMAN (ウルトラマン　空想特撮シリーズ, Urutoraman: Kuso Tokusatsu Shirizu, 1966-67) made its debut on July 1966. Ever since ULTRAMAN GINGA (ウルトラマンギンガ, Urutoraman Ginga), which came out on 2013, Tsuburaya Productions has been creating “New Generation Heroes” series on TV Tokyo every year, with the latest installment being last year’s ULTRAMAN GEED (ウルトラマンジード, Urutoraman Jiido, 2017). 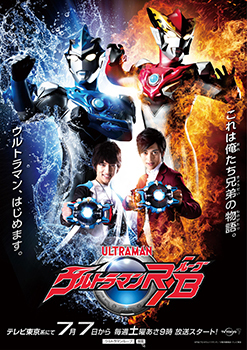 ULTRAMAN R/B will be the 6th New Generation Heroes Series. Please stay tuned to the new TV program which will mark a new chapter in the history of the Ultraman Series. Tsuburaya Productions’ ULTRAMAN LEO series now airs on American television on the TOKU network. © Tsuburaya Productions Co., Ltd.
Shout! Factory TV will partner with social video platform Twitch to host a 4-day marathon of the complete original series ULTRAMAN LEO (ウルトラマンレオ, Urutoraman Reo, 1974-75) beginning Wednesday, April 18. Fans can tune in to watch all 51 episodes from the show’s original run daily from April 18-21 at 3 p.m. PT on Shout! Factory’s official Twitch channel. Warner Bros. Pictures Japan. © 2018 WARNER BROS.
Warner Bros. Pictures Japan has provided a trailer, poster art, high-res photos and logo for the Japanese release of RAMPAGE. The film’s Japanese title — ランペイジ 巨獣大乱闘 (Ranpeiji Kyoju Dairantou) — translates to “Rampage: Behemoth Brawl”. Directed by Brad Peyton, the action adventure global megastar Dwayne Johnson as primatologist Davis Okoye. A man who keeps people at a distance, Okoye shares an unshakable bond with George, the extraordinarily intelligent, silverback gorilla who has been in his care since birth. But a rogue genetic experiment gone awry mutates this gentle ape into a raging creature of enormous size. To make matters worse, it’s soon discovered there are other similarly altered animals. As these newly created alpha predators tear across North America, destroying everything in their path, Okoye teams with a discredited genetic engineer to secure an antidote, fighting his way through an ever-changing battlefield, not only to halt a global catastrophe but to save the fearsome creature that was once his friend. PACIFIC RIM UPRISING Press Junket Interview: John Boyega. Video courtesy of Legendary Pictures/Universal Pictures. SPOILER WARNING: This article previews an upcoming movie. Universal Pictures has provided PACIFIC RIM UPRISING cast interviews from the film’s press junket. A Legendary Pictures/DDY production, the sequel to 2013’s PACIFIC RIM opens in theaters this Friday, March 23, 2018. Trailer for PACIFIC RIM UPRISING, courtesy of Legendary Pictures/Universal Pictures. © 2018 Universal Studios. ALL RIGHTS RESERVED. Universal Pictures has provided a trailer and promotional videos for PACIFIC RIM UPRISING. A Legendary Pictures/DDY production, the sequel to 2013’s PACIFIC RIM opens in theaters on March 23, 2018. Steven S. DeKnight – Director. Video courtesy of Legendary Pictures/Universal Pictures. © 2018 Universal Studios. ALL RIGHTS RESERVED. Universal Pictures has provided short video interviews with the director and 10 members of the cast of PACIFIC RIM UPRISING. A Legendary Pictures/DDY production, the sequel to 2013’s PACIFIC RIM opens in theaters on March 23, 2018. Amara and Jake run from November Ajax in Scrapper. Video courtesy of Legendary Pictures/Universal Pictures. Universal Pictures has provided several clips from their new film, PACIFIC RIM UPRISING. A Legendary Pictures/DDY production, the sequel to 2013’s PACIFIC RIM is directed by Steven S. DeKnight and stars John Boyega, Scott Eastwood, Jing Tian, Cailee Spaeny, Rinko Kikuchi, Burn Gorman, Adria Arjona, Max Zhang and Charlie Day. Toei has provided information, a trailer and high-res images from PRETTY CURE SUPER STARS! THE MOVIE (映画プリキュアスーパースターズ！, Eiga Purikyua Suupaa Sutaazu! ), the twenty-fourth feature film in the PRETTY CURE series. Classes are back in session and anime’s favorite super heroes in training have returned to U.A. High School for another exciting season of MY HERO ACADEMIA (僕のヒーローアカデミア, Boku no Hiiroo Akademia). Funimation has today that Season 3 of the top-rated series will premiere on Saturday, April 7, 2018. As with last season, the first six episodes of MY HERO ACADEMIA will simultaneously stream on the same day and date as the Japanese TV broadcast — in SimulDub on FunimationNow in the U.S., Canada, U.K., Ireland, New Zealand and Australia and in subtitled simulcast on Hulu and Crunchyroll. All 25 episodes of MY HERO ACADEMIA Season 3 will stream in SimulDub on FunimationNow and in subtitled simulcast on both Hulu and Crunchyroll. Movie Set to Hit Theaters 3/11 and 3/12! Presented by Fathom Events and 4K Media Inc., YU-GI-OH! THE MOVIE (遊戯王デュエルモンスターズ 光のピラミッド, Yuugioo Dyueru Monsutaazu Hikari no Piramiddo, 2004) is coming to hundreds of select movie theaters nationwide on Sunday, March 11 at 12:55 p.m. and Monday, March 12 at 7:00 p.m. Following the success of Studio Ghibli Fest 2017, GKIDS and Fathom Events are partnering on a second series in 2018. After a successful series in 2017, GKIDS and Fathom Events continue their collaboration to bring a new line-up of treasured films to U.S. cinemas throughout 2018. Starting in March, STUDIO GHIBLI FEST 2018 gives fans an opportunity to see nine of Studio Ghibli’s revered animated masterpieces on cinema screens nationwide (offering both dubbed and subtitled versions), along with some very special surprises for Fathom Events attendees only. Warner Bros. Pictures Japan has provided information, trailers and high-res photos from their upcoming release, COLOR ME TRUE (今夜、ロマンス劇場で, Konya, Romansu Gekijo de). The movie opens in Japanese cinemas on February 10, and is being offered to foreign distributors by sales agent Fuji TV Motion Picture. Gatchaman’s Joe the Condor and Ken the Eagle are reunited in the new 3DCG anime film, INFINI-T FORCE THE MOVIE. Distributor Shochiku Co. has provided SciFi Japan with a trailer and large pics from their upcoming release, INFINI-T FORCE THE MOVIE (劇場版Infini-T Force／ガッチャマン さらば友よ, Gekijoo-ban Infini-T Foosu/ Gatchaman Saraba Tomo yo). The film is a sequel to the 2017 3DCG anime series INFINI-T FORCE (インフィニティ フォース, Infiniti Foosu), which celebrated the 55th anniversary of Tatsunoko Production with a team-up of the company’s greatest superheroes: Ken of the Science Ninja Team Gatchaman, Tekkaman the Space Knight, Hurricane Polimar and Neo-Human Casshan. Toho’s anime film GODZILLA: PLANET OF THE MONSTERS is now streaming worldwide on Netflix. © 2017 TOHO CO., LTD. Following a Japanese theatrical release last November, the anime film GODZILLA: PLANET OF THE MONSTERS (GODZILLA 怪獣惑星, Gojira Kaijuu Wakusei) is now streaming worldwide on Netflix. Netflix is offering the film with Japanese, English, French, German, Spanish, Portuguese and Italian audio tracks and optional English, Spanish, French, Traditional Chinese and Simplified Chinese subtitles.